Grimas Water Make-up (Pure) is an unperfumed, gluten-free water-based make-up, intended for face-painting and body-painting. Pure means that the product in question does not contain any chemical preservatives (such as parabens) or halogenated organic compounds. Water Make-up works just like watercolour paint. The best way to apply Grimas Water Make-up (Pure) and Water Make-up Pearl Pure is to use a brush. Use the brush and a little water to soften the make-up and make it a bit pasty. Test the colour intensity on the hand. Apply the Water Make-up into the hairline (do not forget the ears and the neck); this will prevent a mask-type effect. 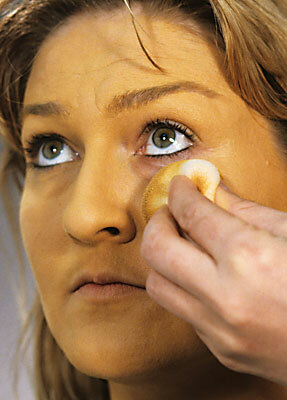 On larger areas, touch it up by dabbing with a make-up sponge if necessary. The shape, width and quality of the brush are to a great extent qualifying the effect you can achieve with it. For instance, round brushes are ideal for making curves and drawing curls. You draw straight lines preferably with a flat brush, keeping the handle of the brush pointed in the direction of the line. The more quickly you draw the line the straighter it will be, and the more pressure you apply on the brush, the thicker the line becomes. To draw a thin line, you do not necessarily need to use a narrow brush. You can also use the edge of a flat brush for that. This brush is also very convenient for making a thick line merge into a thin one, turning the brush on its side in one fluid action as you go automatically changes the line from thick to thinner. When you come to the end of a line, lift the brush from the skin in a single smooth movement. Hint: to make beautiful, thin lines, you mix the Water Make-up with Cleansing Lotion instead of water.